Jili Online 8 + 2 Port Fast Ethernet POE Switch IEEE 802.3af/at Power over Ethernet for CCTV IP Camera,IP telephone, wireless AP by Jili Online at AABX. MPN: da23b6f08bf918a11e7b0509f1ba4ce7. Hurry! Limited time offer. Offer valid only while supplies last. Description: - LED indicators for PoE power and link/activity for ease of use. - 8+2 10/100Mbps Auto-Negotiation RJ45 ports supporting Auto-MDI/MDIX. - LED indicators for PoE power and link/activity for ease of use. 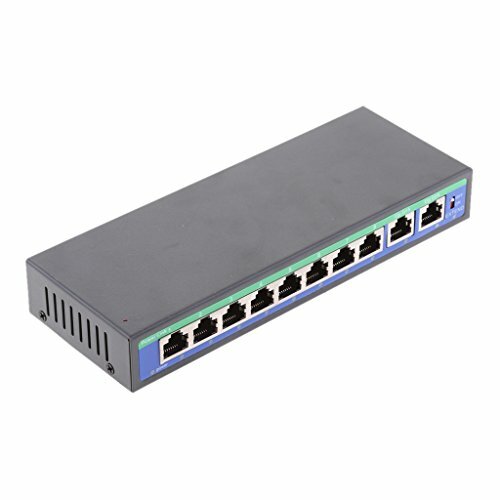 - 8+2 10/100Mbps Auto-Negotiation RJ45 ports supporting Auto-MDI/MDIX. - 8 POE ports & 2 Uplink, complies with IEEE 802.3af,IEEE 802.3at,IEEE 802.3x standards. - Simple network setup on top of plug-and-play connectivity with web-based user interface. - Used for wireless AP,Security CCTV IP camera,IP telephone,wireless bridge,IP print server etc. LED indicators for PoE power and link/activity for ease of use. 8+2 10/100Mbps Auto-Negotiation RJ45 ports supporting Auto-MDI/MDIX. 8 POE ports & 2 Uplink, complies with IEEE 802.3af,IEEE 802.3at,IEEE 802.3x standards. Simple network setup on top of plug-and-play connectivity with web-based user interface. Used for wireless AP,Security CCTV IP camera,IP telephone,wireless bridge,IP print server etc.